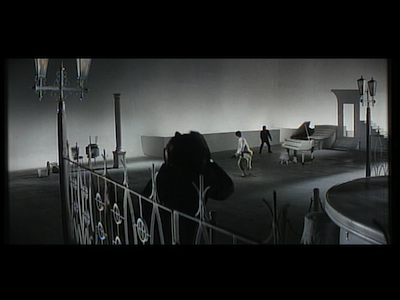 Seijun Suzuki's 1966 yakuza picture Tokyo Drifter starts as a black-and-white film. Tetsu (Tetsuya Watari), a former gangster looking to go legit, is set upon by a bunch of toughs from a rival gang. They are determined to test Tetsu's dedication to the straight-and-narrow while their boss, Otsuka (Hideaki Esumi), watches from a nearby car. Tetsu, who is nicknamed "The Phoenix," has an explosive temper, and our first dose of color comes when Otsuka imagines it going off. It's a quick flash of gunplay reminiscent of the opening of a James Bond film. Except, it's all fantasy, Tetsu doesn't take the bait. The world stays black-and-white. At least until the credits begin. 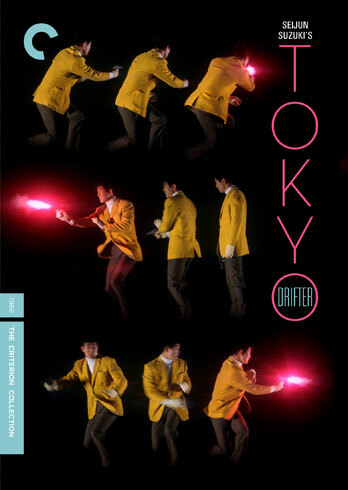 Then Suzuki's full-color version of Tokyo comes to life, accompanied by strains of the Tokyo Drifter theme song, sung by Watari himself. Like the anthem from High Noon [review], this will accompany the gunslinger as he wanders, underscoring his manly adventure by making explicit the lonely path this lone wolf chooses to follow. 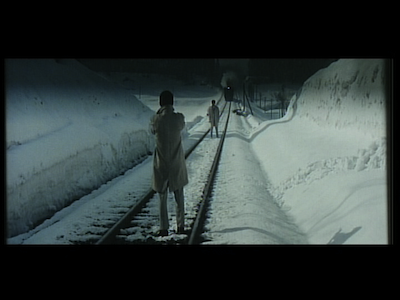 There is much to Tokyo Drifter that is like a cowboy picture, actually. Bar fights, quick-draw showdowns, even a little Ennio Morricone-style whistling. 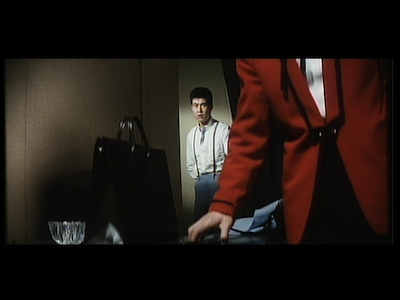 Tetsu certainly takes the same kind of punishment as Sergio Leone's Man with No Name. 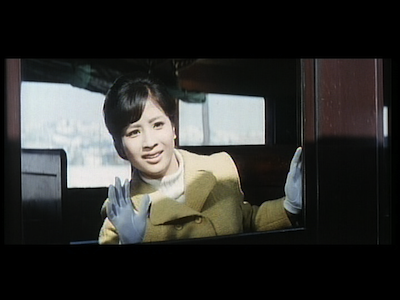 Still, Tokyo Drifter is pure Seijun Suzuki. The plot here is fairly basic. By going legit, Tetsu's boss, Kurata (Ryuji Kita), has left a power vacuum. A loan coming due for the old man gives Otsuka an opening, and he moves in to take Kurata's debt and a valuable piece of property he owns. The scheme is partially successful, but two people are left dead and there is blood on both boss' hands. Tetsu becomes the sticking point in the middle, so he leaves town to avoid further trouble. Otsuka sends his goons after him, while also angling to take Tetsu's woman, a nightclub singer by the name of Chiharu (Chieko Matsubara). 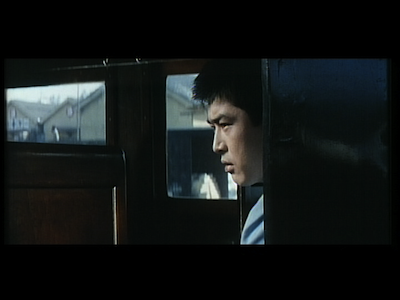 The Phoenix turns out to be harder to kill than Otsuka thought, and after the gangster sets up a double-cross, he finally forces his enemy to return to Tokyo and settle all scores. Tokyo Drifter is a crazy battlefield of violence and color. Suzuki is clearly having fun playing with the cinematic hues available to him. Cinematographer Shigeyoshi Mine plays with background lighting to create great washes of color that he can turn up or down as he sees fit. Likewise, production designer Takeo Kimura crafts a specific color scheme for the various characters. Just as they might have specific musical movements to announce their presence, here they have signature pigments that indicate who they are. Tetsu wears powder blue, a cool and calming color, while Otsuka's jackets are a fiery red. In between is Kenji, a.k.a. "The Shooting Star" (Hideaki Nitani). He was once Otsuka's top gunman, but he has since struck out on his own, not unlike Tetsu, but to pursue his own ends rather than fulfill a misguided sense of obligation. He serves as a voice of reason, and so he is represented by a more earthy green. Chiharu has her own color, as well. The songbird is, fittingly, a canary yellow. This yellow doesn't just show up in how she dresses, but as she sings, the whole nightclub turns to match her hue. 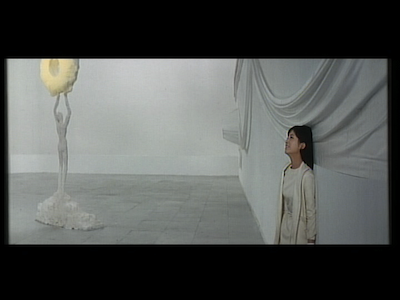 Fittingly, in the movie's intense final sequence, she is an angelic white, matching Tetsu's heroic bearing. All of his enemies--and indeed their whole world--have gone black without him, and it requires his return to illuminate the landscape. The nightclub becomes abstracted, turning into an open space, a more fitting area for Tetsu and Otsuka's gang to have their standoff. The choreography here is fantastic, with the Phoenix really getting a chance to show his skills. The finale also plays long and without tricky cutting, differentiating it from earlier, choppier action scenes, many of which take place out in the open. A dual on snow-covered train tracks between the Phoenix and the Viper (Tamio Kawaji) has the added pressure of a locomotive barreling up the hill toward them. A lone red rail lays between them, marking Tetsu's kill zone. He runs for it, dives to the ground, and then--cut to the train passing. Did he shoot the other man? Did either get run over by the train? We don't know right away, and in Tokyo Drifter, anything is possible. And I do mean anything. 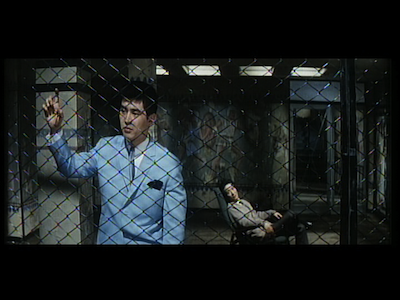 Suzuki is not yet quite as out there as he would be in Branded to Kill [review] the following year--though, to be honest, I found the first 20 minutes or so of Tokyo Drifter to be way more confusing--there is already an anarchic "anything goes" quality to Suzuki's work. This is a movie, after all, that stops twice for commercials for blow dryers. It also has a hero that is not just prone to having a running interior monologue, but tends to burst out and sing his own anthem. A little skullduggery in the editing bay doesn't seem like much next to those sorts of shenanigans. Yet, for all the fun that is to be had, Suzuki maintains a cynical edge throughout. One doesn't expect him to draw the hard line that the lyrics of the Tokyo Drifter theme suggest--all the elements of a romantic ending are there: a vindicated hero and the woman who loves him--but that's exactly what the filmmaker does. For all that he has sacrificed by sticking to his code of honor, Tetsu is prepared to sacrifice more rather than ever lower his guard. This is why he can never be true allies with Kenji, as he thinks Kenji is beholden to nothing. Tetsu is bound by his own belief in the way things should be, and while men all around him let him down and flip-flop, he has all the more reason to stay true, however that may be to his own detriment. Please Note: The screengrabs in this review are from the DVD of Tokyo Drifter originally released by Criterion in 1999. The upgraded Blu-Ray comes with a phenomenal high-definition restoration. The colors on the newly minted print are vibrant and highlight all the subtleties of design that Suzuki originally intended. Even the black-and-white opening is like night and day between the two discs. Tokyo Drifter in HD pops like never before, so make sure you get the edition with the cover you see up top, whether it be the BD or the new version of the standard DVD. It makes all the difference.